I'm on a drugs trial for a cancer drug, which has side effects, but this week was the first time I've needed added standard medications to help. And they've reacted badly with each other. I've felt sick, dizzy, sleepy, nearly passed out, vomited......a lot. You name it, it's happened. But you know what? "Sod it"
Seasider in the City is hosting this week, so get yourself over and check out the blog hop. Maybe have a go yourself! P.S. It's my turn next week, gulp! 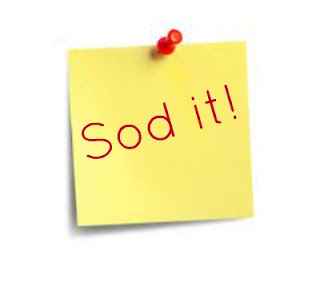 Oh, I'm not going to worry about it, new motto is "Sod it!"